The Super Screener Top Win Pick, Gray Attempt, did not disappoint and took this field wire-to-wire in what was a merry-go-round type race, with the top 5 finishers ending in the same order in which they started. As the second choice, pundits questioned Gray Attempt’s ability to win on his first try at a route, but the Super Screener was quite confident that the stretch out would pose no problem. In addition, the Super Screener Top Long Shot pick, #5 Boldor, also cooperated, completing the Trifecta at odds of 12-1. Seeing enough positive signals in the horse to believe he would outrun his odds. 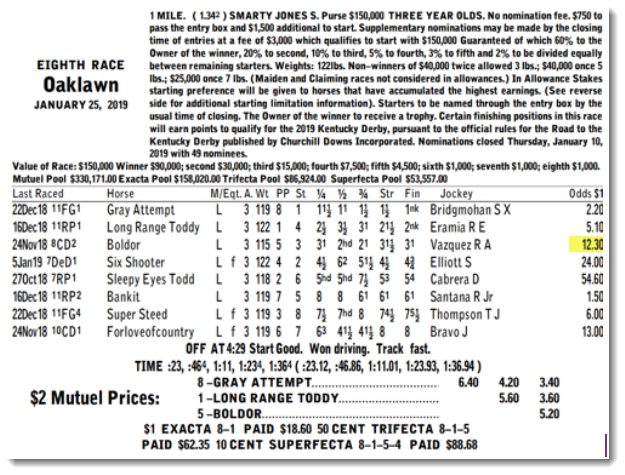 As far as the Kentucky Derby trail goes, while it was a sharp effort for Gray Attempt, his running line in this race came back just so so… nothing to match the patterns we have seen from prior Kentucky Derby winners’ superior “early prep” races run in January. For the balance of the Trifecta, the Super Screener tabbed the 2nd and 3rd place finishers as must-use players, underneath. The Super Screener suggested $2 ticket scored for a return of $627. Make it 3 in a row for the Super Sceener’s Top Win Picks as #6 Aztec Sense contested sharp fractions on the sealed, sloppy surface and then held a very safe lead to capture the win. Unbridled Juan was our top board hitter pick, but he missed that 3rd place spot by a head to the 70-1 long shot bomber, Fellowship. A Super Screener “A” horse, #4 Zulu Alpha won this race as the favorite but our stand-against horse, Soglio, held form and finished a clear 2nd. Top pick Canessar could only muster a 5th place finish, and Village King couldn’t carry that late turn of foot over more ground and flattened out finishing 7th. Chad Brown-trained #7 Bricks and Mortar could be undefeated had it not been for troubled trips in those G3 races last year. Injuries forced him to the sidelines for over a year. Connections wanted to run in the BC Turf but couldn’t get him ready in time. Come back race was the perfect prep and can move forward off that… added ground is not a concern despite this one erroneously being labeled a “miler”. The Super Screener Top Long Shot pick, #8 Delta Prince, took the lead briefly in the stretch but was outgunned by the top two finishers. It was a strong effort, regardless, especially at odds of 9-1. But due to the rain, we unwisely downgraded #1 Magic Wand due to the preference for firm going. Lesson learned… don’t mess with the Super Screener rankings unless there is some extremely obvious lack of affinity for a surface. The Super Screener declared earlier in the week that #3 City of Light would be the dominant winner of this race and cited why he was a better top win choice and “single” over Accelerate. #3 City of Light – TOP VALUE/PRESSER – This horse submitted the best performance over the Breeders’ Cup weekend, bar none. He cut absolutely brutal fractions and then went on to win easily while doling out strong energy, late. Can get this distance, especially since horses running on this speed-favoring track can carry their speed further. Working super, offers value and is the one to beat. #4 Seeking the Soul – TOP LONG SHOT/CLOSER – Was clearly 2nd best in the Breeders’ Cup Dirt Mile. Came back way too soon after that peak performance, leading to a flat finish in the G1 Clark. Has been working super leading up to this. This is the best candidate of the 20-1+ long shots to make an impact on the Exotics. Will sit the perfect trip mid-pack trip and then continue to grind on. See “lesson learned” in the Pegasus Turf summary. 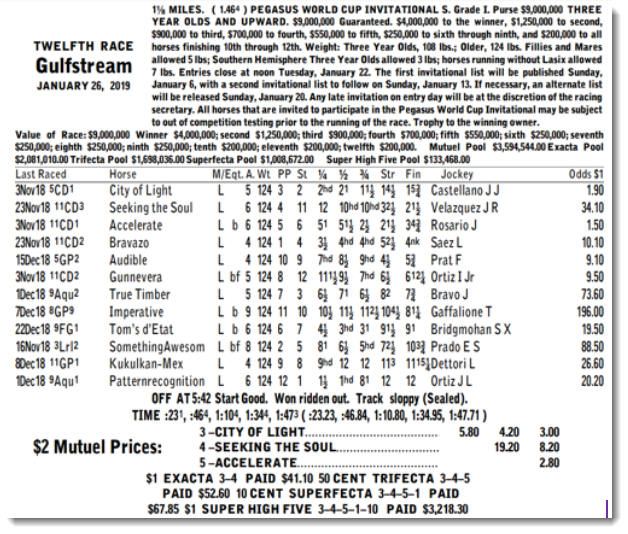 Given the track turned sloppy/sealed Saturday morning, we regrettably downgraded Seeking the Soul and withdrew him from the 2nd place spot in wagers. Had we left well enough alone… the Super Screener suggested $5 Trifecta wager would have paid $526. 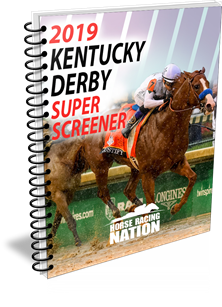 However, thanks to the Super Screener conviction on #3 City of Light and having all “A” horses win in prior races, a bunch of the Super Screener Late Pick 4 tickets hit for a total of $415. The Kentucky Derby trail heats back up again Saturday with the Withers being run at Aqueduct, the Holy Bull at Gulfstream and the always important Robert B. Lewis going at Santa Anita. 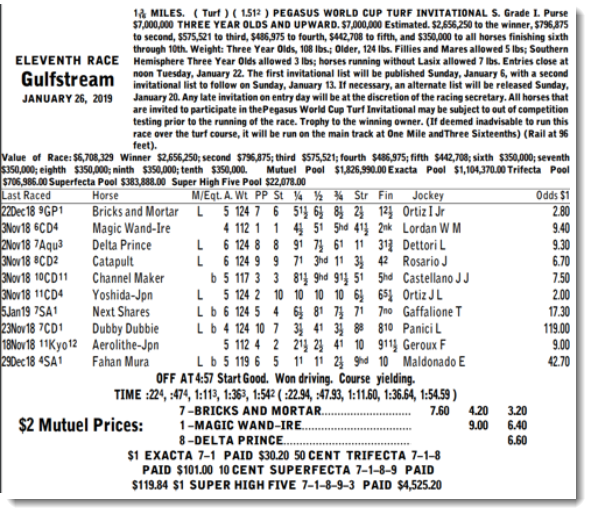 In addition, GP and SA cards feature a bunch of G3 stakes races… some featuring deep and competitive fields. Don’t miss any of the great pre-Super Bowl action!